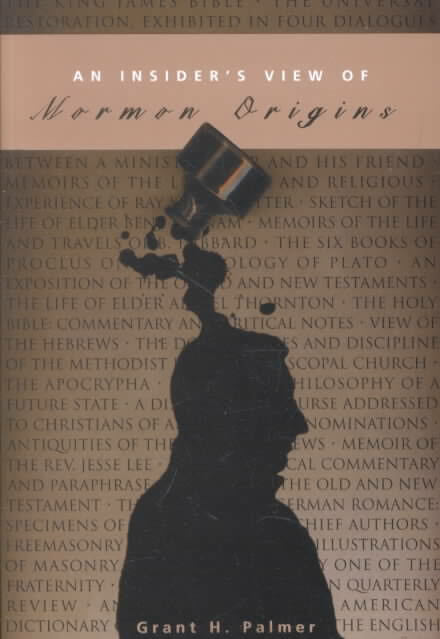 Grant H. Palmer, An Insider's View of Mormon Origins, Salt Lake City, Signature Books, 2002, 281 pages, paperback, ISBN 1560851570. In this book, Grant H. Palmer (a fourth-generation Mormon, Brigham Young University graduate: M.A. American History) provides a helpful summary of the enormous amount of research that has been done over the last 25 years concerning the origins of the Church of Jesus Christ of Latter-day Saints (LDS Church — the Mormons). The word “Insider” in the title reflects his thirty-four years of experience as an Institute Director for the Church Educational System (CES); however, throughout the eight chapters Palmer challenges the many traditional claims that inspire members of the LDS Church. He is now retired from the CES. "The word 'Insider' in the title reflects his thirty-four years of experience as an Institute Director for the Church Educational System (CES); however, throughout the eight chapters Palmer challenges the many traditional claims that inspire members of the LDS Church. " Palmer prefaces his book by giving two reasons why he feels compelled to publish a book that describes concerns he pondered mostly in private during his service career in the CES. First, he wants to introduce LDS Church members to issues that are central to the topic of Mormon origins by surveying what has been termed the New Mormon History. Second, he wants LDS Church members to understand that historians and religion teachers like him are actually salvaging the earliest, authentic versions of the LDS Church stories from being rewritten by well-meaning censors who have abridged and polished them for institutional purposes (p. x.). Palmer’s candid discussion of the foundations of the LDS Church begins with the Book of Mormon. In chapter one, Palmer discusses Joseph Smith’s ability to translate ancient documents. He highlights a large body of evidence that strongly implies Joseph Smith never translated any ancient document, and he believes the Book of Mormon represents a “nineteenth-century encounter with God” rather than an ancient epic. After focusing on the authorship of the Book of Mormon in chapter two, Palmer concludes with his thoughts of how Joseph Smith produced the Book of Mormon. He outlines a timeline for the making of the Book of Mormon that is much longer than what most Mormons generally acknowledge. Although his scenario is coherent and will likely be embraced by some of his intended Mormon readers, it lacks the biblical support orthodox Christians would require in order to take the “great leap” needed to believe the Book of Mormon represents even a “nineteenth-century encounter with God.” Joseph Smith’s folk magic (occult) background and teachings are irreconcilable with the teachings of Jesus and his disciples and give Christians warrant for rejecting the Book of Mormon as being sourced in the God of the Bible. Palmer continues focusing on the authorship of the Book of Mormon in chapter three by challenging the claim that it is an authentic ancient history. He gives five examples that exemplify the Bible’s influence on the Book of Mormon as observed by Krister Stendahl, (at the time dean of the Harvard Divinity School). Most of chapter four concerns the subjective nature of specific Protestant denominations (Palmer mistakenly refers to them as evangelicals. Unlike today, Protestant denominations during the 1820’s were not called “evangelicals”) in western New York during the 1820’s and its influence upon Joseph Smith’s writing of the Book of Mormon. Contrary to the accepted Mormon position, Palmer personally doubts the reliability of interpreting religious feeling as an affirmation of spiritual truth, and basing subsequent religious commitments on these feelings. Chapters 5 and 6 consist primarily of popular beliefs about the supernatural held by people who were contemporary to Joseph Smith and informed his experiences and interpretation of the world and how these beliefs became part of the early narratives about his life. It is divided into twelve chronological episodes which Hoffmann calls vigils. The main character, Anselmus, is a young theology student who hopes his professor, Conrector Paulmann, has some work for him. Anselmus’s life is humdrum and evokes neither sorrow nor joy. He feels that he possesses little influence in the world. Chapter 6 examines both published and unpublished statements and experiences of the witnesses to the golden plates that reveal a stark contrast between today’s rationalist perspective and their nineteenth-century magical mindset. The witnesses shared the common belief in the “second sight” which included the ability to see spirits and their dwelling places within local hills and elsewhere. Palmer’s work helps readers understand these men more fully and weigh the value of their testimony. Chapter 7 examines how several of the earliest historically verifiable accounts of the LDS priesthood restoration differ from the story told today. The earliest reference to the priesthood appeared in the 1833 Book of Commandments (the earliest version of and precursor to, the Doctrine and Covenants). This book makes an important contribution to the study of the Mormon origins. I think many readers will be grateful to Palmer, for he has collected in one book much factual material that previously would have required one to research numerous sources. If you desire a candid examination of the foundations of the LDS Church, then this book should be on your required reading list. As Latter-day Saints, our religious faith should be based and evaluated by how our spiritual and moral lives are centered in Jesus Christ, rather than in Joseph Smith’s largely rewritten, materialistic, idealized, and controversial accounts of the church’s founding. I hope that this study contributes in some way toward that end. However, this conclusion is puzzling. For Palmer has largely undermined the key historical claims of Joseph Smith that are the basis of the idea that the LDS Church and its message are “restored” Christianity. In that case, why should the church Joseph Smith founded be the source for establishing a relationship with Jesus Christ? 1. Krister Stendahl, “The Sermon on the Mount and Third Nephi,” in Reflections on Mormonism, Judaeo-Christian Parallels, ed. Truman G. Madsen (Provo, UT: Brigham Young University Religious Studies Center, 1978), 149, 152 as cited by An Insider’s View of Mormon Origins, p. 69. 2. As an evangelical Christian, I would like to offer at least one biblical interpretation concerning how to discern the work of the Holy Spirit. As a possible help in understanding how the Holy Spirit works, Palmer quotes Moroni 7:13, “Wherefore, every thing which inviteth and enticeth to do good, and to love God, and to serve him, is inspired of God.” He interprets this verse to mean “the Holy Spirit will witness to that which brings a person to Christ (John 14:6).” He asserts that when a person “experiences the Spirit” it is actually a “God-felt urging to repent and come unto Christ,” yet it does not prove the “truthfulness of the doctrines heard, taught, or read” (p. 133). Palmer does not offer any suggestion on how one who feels they have “experiences the Spirit” is to discern if the “Spirit” is truly the Holy Spirit. First John 4:1 warns, “Beloved, believe not every spirit, but try the spirits whether they are of God: because many false prophets are gone out into the world.” The apostle John tells us how to both know “the Spirit of God” (1 John 4:2) and how to discern between “the Spirit of truth, and the spirit of error” (1 John 4:6). First, many false teachers have denied that Jesus Christ was fully human. During the late first century the apostle John refuted these false teachers by writing, “Every spirit that confesseth not that Jesus Christ is come in the flesh is not of God” (v. 2). It is important to know what this verse does not say. It does not say, ‘Every spirit that confesseth that Jesus Christ is come in the flesh is of God.” Therefore, the converse of v. 2 is not necessarily true, that is, a spirit which confesses that Jesus Christ is come in the flesh is not necessarily the Spirit of God, however, the Spirit of God always confesses that Jesus Christ is come in the flesh. Second, the “Spirit of God” is most certainly the “Spirit of truth.” Those who know God by the Holy Spirit through faith in Jesus Christ recognize the “Spirit of truth” by knowing it always confesses that Jesus Christ is come in the flesh and by listening to those from God who speak in the Bible (v. 6). “All scripture is given by inspiration of God, and is profitable for doctrine, for reproof, for correction, for instruction in righteousness” (2 Timothy 2:15). Ever since Eve doubted the Word of God in Genesis 3:1-4 the spirit of error has led others to doubt and not listen. People who are not of God refuse to listen to the biblical teaching by those who are of God and these people are of the spirit of error (v. 6). Christianity is unique because vast amounts of historically verifiable, objective evidence corroborate the “truthfulness of the doctrines heard, taught, or read” by those who know God by the Holy Spirit through faith in Jesus Christ. 3. Current at the time of writing.